Heather does not mean that last line literally. Psycho Heather, Qu’est Que C’est. Ha ha ha ha ha ha ha ha Heather. For today's commentary, I wanna talk Ricky. Even though he's been part of the Orphanage Crew since the strip's inception, I feel like Ricky's never really established much of a role for himself. He's Tony's friend/hanger-on, he likes roughhousing, and... that's about it. Of all the kids in the Orphanage Crew (and I include Selkie and Heather in this despite their adoptions), I feel Ricky is the weakest link story and character wise. What made me realize Ricky had this problem? Two strips ago, I forgot to draw him. 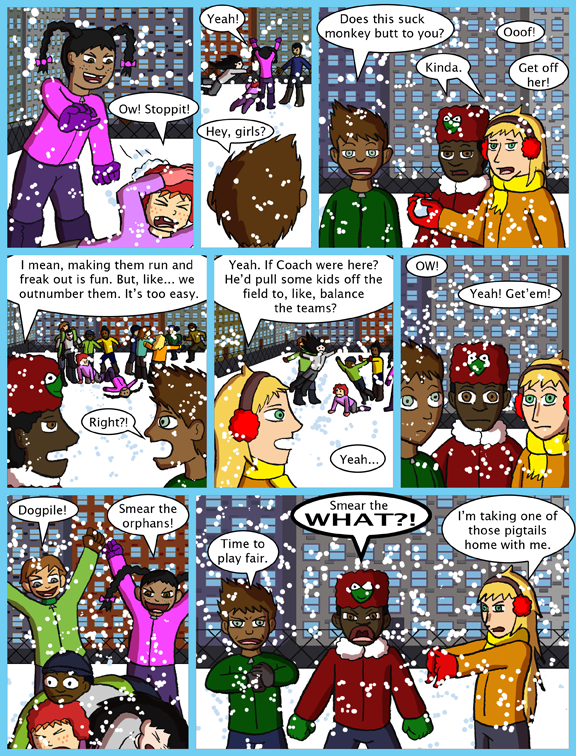 The last panel, the overhead shot showing the entire snowball fight skirmish breaking out. I drew it, I inked it, I even did a head count to be sure, and yet somehow it wasn't until I had gotten halfway through coloring the strip that I realized I hadn't included Ricky in the cluster. I "fixed it in post" by drawing him in with my tablet, but I felt bad that I had completely forgotten to include the guy in the group shot. Fast forward to this strip. My original scripts had Chanelle talking with Keisha and Heather in this strip. But while thinking about Ricky, and reading over Giselle's "Smear the orphans!" line I got to thinking... Ricky is one of the orphans too. He's part of the group as much as any of the others. Does he hear this comment and just not care? That's dumb. Yeah he'd care. So why are Keisha and Heather the only ones getting mad at it? I rewrote the script and replaced Chanelle with Ricky for this part. I'd like to give Ricky a chance to grow a bit more and find a stronger place in the story than just Tony's hanger-on. Plus, Ricky is part of the Crew. He should be more involved. This means downgrading Chanelle's role in the scene a bit, but she's a "school friend", tertiary support cast. Ricky can and should have dibs on "screen time" over a character who basically disappears when the kids aren't at school. Chanelle: But, I thought Heather had parents? Keisha: Yeah, but she USED to be an orphan. Same thing. Heather: [scoops two fists full of snow and lofts them over her head] SOLIDARITY! Best commentary ever. don’t worry when your cast is big you can lose track don’t feel bad. Keep up the good work! Heather is double-plus good. 🙂 I hope she does mean it (although I don’t think she should go through with it). I also like that they’re getting the idea of fair play. And turning it into a justice thing – Smear the orphans is not only a bad thing to say, it telegraphs a rift in the class that is between the haves and have-nots that I’m surprised the teachers are not on top of. OMG classic I LOVE it. GO heather! You stupid, stupid brats, what side did you think you were on? Overcoming peer pressure – it’s a good thing. I would think ripping the pigtail off Giselle’s head would get her in more trouble than just cutting it off with scissors. Would hurt a lot more for one thing. 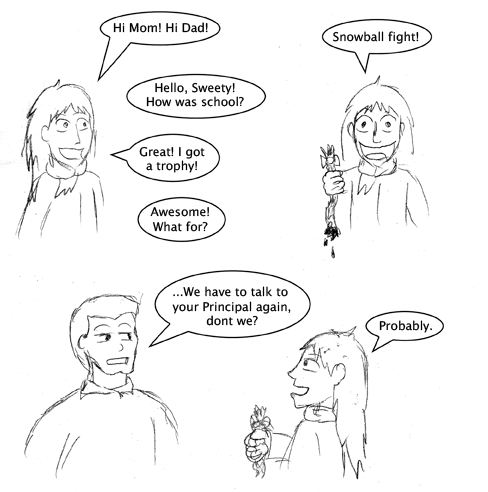 Two comments: First, I think the sketch with Heather showing her trophy was kind of cute until you had blood dripping from it. Little bit too far, there. Second, I have no idea (nor do I care) who these kids are, and I’ve read every single comic. The thing is, I read a lot of comics on a weekly basis. 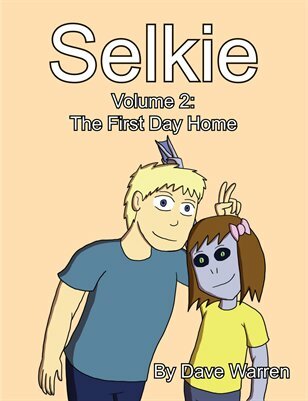 Selkie has a place in my brain, as well as Todd (and the girl from Wal-Mart/the TA, for some odd reason), but I don’t think every kid needs screen time because, ideally, the comics not about them. If it is, change the name to “Orphan Kids” or something. Otherwise, don’t worry so much about each secondary character having a complete background and characterization. As long as you’re consistently telling a good story and not dropping major details, all is good. Strips like todays (though funny) are a bit confusing because I really have no idea what they’re upset about. The last I saw, Selkie was running off to distract some of the kids. You should have picked back up with that, as it’s her comic. Even though the comic is named after and revolves around Selkie, I’ve always felt it’s more of an ensemble cast. Kind of like how even though The Simpsons are in every episode of their show, some episodes are more about a side character’s life. That’d be an incredibly boring comic if it only followed Selkie. You wouldn’t be able to relate to anyone at all aside from her. Everything would be incredibly one-sided and boring. If we didn’t know Amanda got ‘returned’ we’d all just believe she was a horrible little monster and not just a scared little girl who thinks no one could ever love her. Or that Heather was just an obnoxious brat who likes to steal clothes instead of a little girl who was frightened and confused about her friends alienating her; she only wanted to be accepted again, she wasn’t being malicious. There are plenty of comics that revolve around just a few characters and their wacky adventures (and if anyone thinks that just following Selkie around would be boring, you’re reading the wrong comic). If you look at the stretches of Selkie that are just about her and her dad (like them going shoe shopping), you can see that it works. The salespeople at the fancy shoe store didn’t need creative backstories to add to their characters. You got all the sense of who they were that you needed for the story to work, and then they were gone. Good storytelling is about paring down to the essentials (especially in as limited a media as comics) as much as it is about being creative. I’m NOT saying this comic is bad. It’s not, and I personally LOVE it. It’s actually made me consider adoption. I’m just saying that on days like this, you’re going to confuse some of your readers because not everyone can keep all the characters from every web comic they read in their head at all times. It’s that exact reason that most of them use such small casts in the first place. I think you’re making a good point here about the cast size. The supporting cast is pretty big compared to a lot of comics. Got me thinking, maybe implementing tags would be a good idea at this point, for moments like these or just general use of reminding yourself. its good to have the characters fleshed out for yourself, as it keeps you on track of things like “how would this person do this” but its a balance of how much of that the reader sees, some characters even get scrapped or phased out entirely. if you feel like your forcing screen time, you probably are ^_^. its okay to have a huge cast mind you i like seeing a good variety of characters. In this scenario I don’t feel I am forcing screen time. Ricky’s role in the conversation originally belonged to Heather and Keisha’s friend Chanelle, I just swapped them around. Now if I had shoe-horned Ricky as a third piece of a conversation he had no role in, it’d be different. If anything this probably slightly condenses the “fleshing out of background characters” since Ricky is already a re-occurring cast member and is statistically more likely to make appearances in strips than Chanelle, since he lives at the orphanage with the others and is buddies with one of the antagonists. Of the two of them, Chanelle is the one who needs fleshing out the least. I love that you pay attention to your side characters and give them stories. IMO it adds more depth to the story and makes more of the characters likable. What I love about when authors do this is the diversity it brings to the fan base. You get more than just fans of the main characters this way and different kinds of thinking. I think the amount of love for Jessie and Heather among the fans shows this. That last line by Heather was pure magic. Took all I had not to bust out laughing at work (not that I would ever dream of reading web comics at work 😀 ). Hey Dave, you might want to change the dialog in panel two. Since he’s talking to Ricky and Heather instead of Heather and Keisha I don’t think he should be saying “Hey girls”. Just a thought. That is Ricky. He’s talking to Heather and Keisha. Heather is SO CUTE in the last panel, I just want to take her home. I’ve been following this comic a long time, but the phone wasn’t allowing me to comment. I love the drawing of Heather in the last panel. It’s awesome.